I'm beginning to think that olive green is my new favorite color. Every piece of clothing that I want to add to my closet seems to be that muddy shade of green, including most of my picks from the Nordstrom sale. Olive is such a pretty shade to wear, especially in the fall, and I love how it pairs perfectly with all colors from black, to browns, and even navy. This olive blouse is from Forever 21, and I'm obsessed. I love the blousy fit, roll-tab sleeves, and the price. It is under $16, and also available in blush, my other favorite color. I paired it with my denim cutoffs, and finished my outfit with navy booties for a cool summer look. On a more personal and sad note, I got the news Wednesday night that my grandmother had passed away. Although I knew this day was arriving soon, as she had Alzheimer's, it's still hard to accept that fact that she is no longer with us. She hadn't been herself for a while, so I'm happy that she is finally at peace and reunited with my grandfather. I will be in Vermont this weekend for her funeral, and spending time with my family. Please excuse my absence from the blog for the next couple of days while I mourn her loss, and celebrate the amazing life that she had. We have two feature bloggers this week! Nancy from Nancy's Fashion Style and Jessica from Jeans and a Teacup. 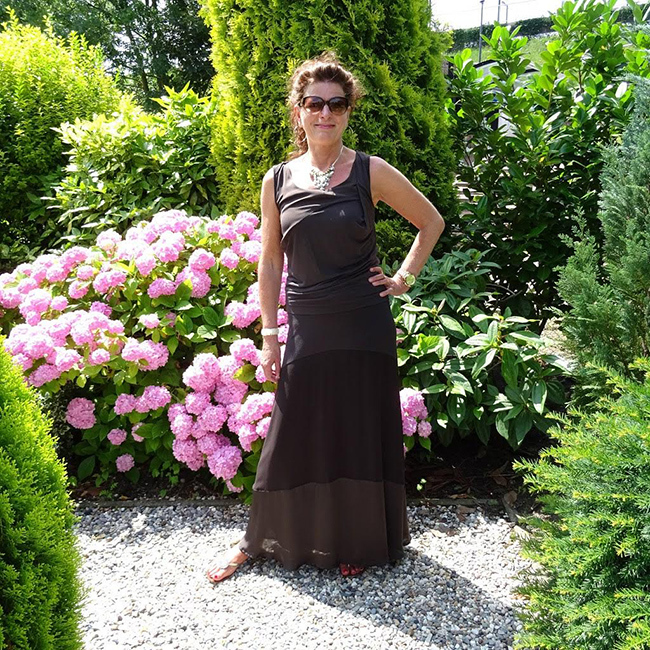 I'm loving Nancy's black maxi skirt and the multiple ways she wears it, and I'm obsessing over Jessica's linen jumpsuit! Make sure to visit their blogs and say hello. My condolences on the loss of your grandmother and much strenght in the near future. And this outfit looks amazing. I also love olive green. And speaking of that blouse that also comes in blush....blush with olive green would look fabulous together! Thank you for your kind words Shelbee! Thank you so much Jaymie! SO sorry for the loss in your family. My grandmother and aunt both passed due to Alheziemers so I know the pain and how it can seem to last forever. Thanks for sharing! Prayers your way! Thank you so much Garay! Alzheimer's is the worst, but at least she is at peace now. Olive looks great on you! I love the belt with the shorts too. I am so sorry to hear about the passing of your grandmother Rachael. My thoughts are with you. On a lighter note, I LOVE this look on you. Perfect transitional outfit! Thank you so much Elise. I hope you have a wonderful weekend. I love olive, too. Great outfit; you look fabulous! I'm so sorry for your loss, Rachael! My thoughts are with you and your family! Loving that double buckle belt! Great weekend outfit!! Thanks for featuring my look! I'm loving your denim shorts! I need to get a good pair of cut offs. And I'm sorry to hear about your grandmother. My grandfather passed away in October so I know that it's hard even when you are expecting it. Thinking of you! Thank you so much Jessica. It's hard, but at least she's at peace now. Also, I still can't get enough of your jumpsuit! I love your olive blouse it looks good with your denim shorts! Kaki blouse is my style too! I like your nice outfit! Love that olive top! The Nordstrom sale has some awesome pieces right now! So sorry for the loss of your grandmother. I recently lost mine a few months ago to Alzheimer's as well. It's so hard to watch them suffer and such a terrible disease but at least she's at peace now. Thoughts and prayers to you and your family. Thank you so much Nicole. It's such a horrible disease. Wow, love your style! Just found your blog through the WW link up. Would love it if you'd link up with my Friday link up too. Following you now! So cute!! Loving the cut offs and ankle boots! So stylish! Very stylish outfit! great look! These are the perfect denim shorts! loving the cutoffs with the belt! I'm so sorry about your grandmother. I'm sending prayers your way. Even when it's not a surprise, it's still difficult to lose a loved one. 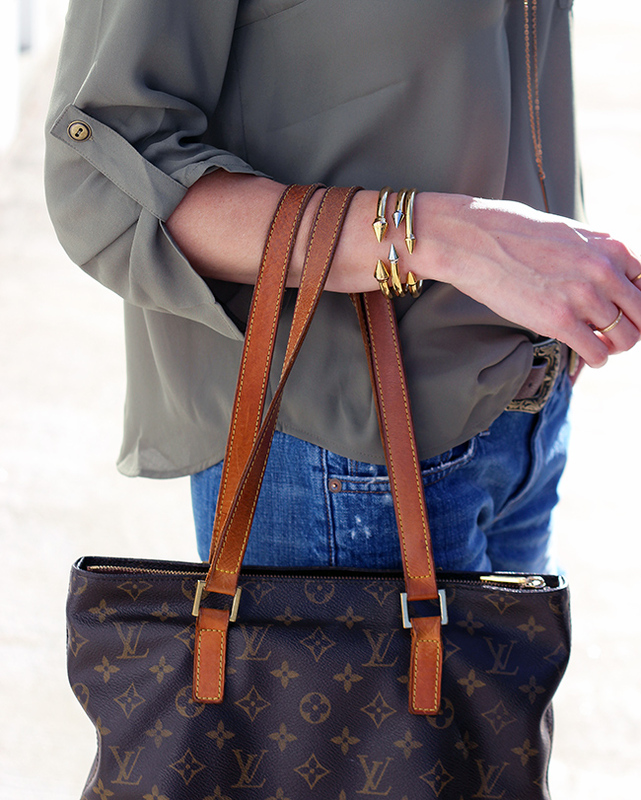 Love this outfit--you're making me want to get more olive in my wardrobe! Thank you so much for the kind words Shea! So sorry about your grandmother <3. I love the color of this blouse. You look gorgeous!! I love this outfit! Looking so chic in olive green- and those shorts are killer on you, lady! I am loving this everyday chic look, the top looks so comfortable and those boots are to die for! I'm so sorry for your loss! Sending my prayers to you and your family. I'm a huge supporter of olive green too, and i love how you accessorized this simple outfit. Those bracelets and necklaces are beautiful with it! Thank you so much Emily. I think olive green is going to be my go to color this fall! Love your western accessories. Great styling! Olive green is one of my favorite shades recently.